Throughout the holiday season, I will be bringing you a series of posts that will combine both of these concepts called Shop Local/Shop Smart - bringing you great gift ideas for under $250 from local designers and retailers. Earlier this year, I introduced you to Caitlin McConnell, a blonde bombshell who's blinging the world! Any Princess (or Queen) would love to find this little doo-dad in her stocking come Christmas morning! 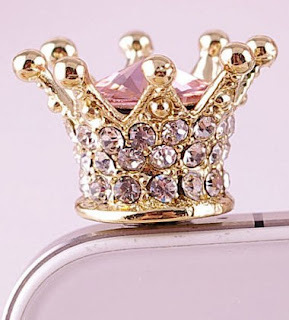 Get a limited edition Crystal Crown Earphone Cap for iPhone 4 & 5 for just $14.99 from Bling is the New Black. Send an email to bling.me@hotmail.com if you would like to order one (and tell her you saw it on OSC)! !